A sure sign of industry growth is tradeshow growth, and the Global Pet Expo, hosted by trade organizations APPMA and PIDA, has quickly become one of the most significant. Industry publication Tradeshow Week recently named the Global Pet Expo one of the top 50 fastest growing trade, association, and consumer shows of the year. International trade shows are also growing in popularity. In 2006, the number of international companies exhibiting at Germany's Interzoo was up 75% from the previous show. The leading nations besides Germany were China with 160 companies, up from 126 in 2004, and the USA with 129 companies, compared to 111 in 2004.
International Council of Shopping Centers trade shows include the 2007 ICSC Specialty Retailing Conference on Feb. 20-23 in Palm Springs, CA. WWPIA hosts SuperZoo on Sep. 18-20 in Las Vegas, and America's Family Pet Expo. Pet Fair Asia consists of Pet Fair Professional and Pet Paradise Asia on Sep. 19-22 in Shanghai, China. Check out the Pet Industry 2008 Strategic Outlook by Dillon Media. PetSmart Inc., the nations largest pet specialty retailer, posted higher earnings in its third quarter 2006 results. Net income grew1.9% to $31.7 million on net sales of $1.0 billion, up 14% from the same period in 2005. Comparable store sales grew 6.8% in the quarter, compared to 2.4% during last year's third quarter. Pet services sales were up 25.4% to $89.7 million. In earlier conference calls, CEO Phil Francis has said services customers on average spend more money and return to the store more often than others, and that dog grooming is the primary driver of the services-oriented pet parent into the store. 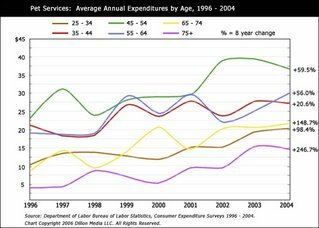 Pet services spending has grown consistently over the last decade. These days, both the busy professional and the empty nester happily spend record amounts of money on dog grooming, boarding and training. And the aging demographic of American househoulds should continue to drive this trend in the future. Click on the chart to enlarge. Check out this search engine tailored to pet health symptoms, diseases, medications and information. Animal Planet, owned by Discovery Communications, adopted Petfinder.com and PetsIncredible as it expands its reach into consumer channels. Earlier in 2006 the company announced plans to bring its Animal Planet Expo to twelve locations in the U.S. PetsIncredible sells DVDs for pet owners and trainers, and the popular adoption site petfinder.com generates 120 million page views each month, according to Mediaweek. Starbucks, in a localization trend, has started to appeal to dog owners. According to the Wall Street Journal, a Starbucks in Portland responded to strong dog owner demographics by adding an outside window counter so customers can purchase coffee without bringing their pets inside ("At Starbucks, Coffee Comes With New Decor," by Janet Adamy, The Wall Street Journal, Nov. 10, 2006). New for the 2006 holiday season from Coach is a private label pet carrier costing $398. This continues a relatively slow expansion into pet supplies for the company.